the acoustique panels of designRAINER are high sound absorbing panels, which can improve room acoustics, for a better living and a better speech ineligibility. they are extremely easy to install and versatile. they can fit every kind of ambiance, from conference hall, meeting rooms, open plan offices, movie theater, home theater, restaurants and every place where people meets. 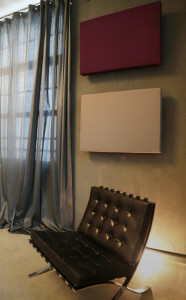 One Side panel (OS): they are sound absorbing panels made with an aluminium structure and coated with textiles on one side only. they are made for ceiling and wall mounting. Double Side panels (DS): they are sound absorbing panels composed by metal structures and coated with textile on both sides; they are made for ceiling application (vertically) and as a room divider. Free Standing panels (FS): they are sound absorbing and sound insulating; they are made as acoustical room dividers and improve rooms’ acoustics. The FS panels are coated with textile on both sides, and self-supported with chromed metal feet. Table Screen panels (TS): they are sound absorbing and soundproofing; studied to divide two work station (desk). The TS panels are coated with textile on both sides equipped with metal hanger to hold on desk. 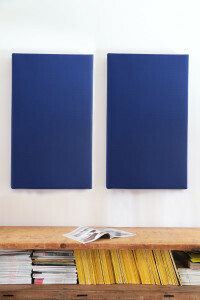 Pannelli audio Bluetooth: they are sound absorbing panels made with an aluminium structure and coated with textiles equipped with an integrated Bluetooth sound system. As all designRAINER products the acoustique panels are made with the latest technology row materials and high quality manufactures. they are completely made in Italy.